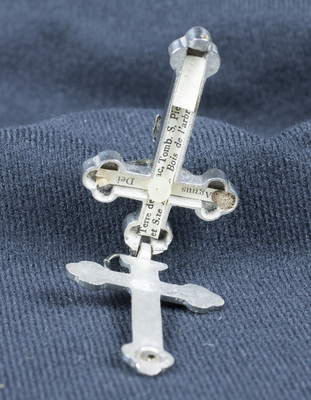 "Crucifix reliquary containing wood from the tree of Saint Dominic and "
Crucifix reliquary containing wood from the tree of Saint Dominic and earth from the tombs of Saint Peter the Apostle, Saint Paul the Apostle, and Saint Cecilia. Saint Dominic (1170-1221) founded the Dominican order. Saint Peter was one of the Twelve Disciples, was the first Pope, and died a martyr. Saint Paul the Apostle wrote much of the New Testament and was also a martyr. Saint Cecilia was a virgin martyr, and is the patron saint of music.